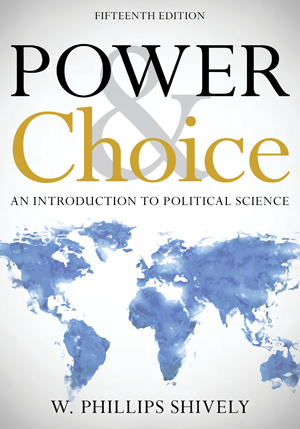 Welcome to the Companion Website for Power & Choice: An Introduction to Political Science, Fifteenth Edition, by W. Phillips Shively. This open-access Companion Website is designed to reinforce the concepts covered in Power & Choice, Fifteenth Edition. You can review and enhance your understanding of each chapter using the interactive flashcards and self-graded quizzes. A test bank of multiple choice, true/false, and essay questions accompanies this text along with Respondus customizable testing software. Instructor ancillaries are password-protected. For access to the teaching materials, please visit Power & Choice and Sign in if you are a registered user. First-time users should Register then email us at textbooks@rowman.com.